My name is Jesse Garon. My friends and I have been the victims of a couple of GAY BASHERS for almost 10 years now. We have captured several incidents on video tape and yet Louisville, Kentucky refuses to prosecute the bashers, and now the local Human Relations Commission and Irv Maze's County Attorney's office are going to court to try to take away our right to prosecute our civil case against the bashers. This is the same IRV MAZE COUNTY ATTORNEY'S office that could not prosecute the bashers in criminal court. It is the purpose of this site to put a spotlight on the local politicians, lawyers, and government officials who are working to make sure Louisville Kentucky never reports a GAY HATE CRIME. We have experienced terroristic threats, property damage to real property and personal property, cut phone lines, broken and shot out windows, ambushes leaving or entering the property. The gay bashers have admited their crimes but still have not been prosecuted. The local county attorney's office of Irv Maze has fought us every step of the way. The latest is they have now filed a motion to remand the Steve Redmon vs Louisville and Jefferson County Human relations commission and Jesse Garon case no. 2005-CA-000411 back to local court so they can see if a judge will deny us our right to recover civil damages and allow the HRC to settle the case without the damaged parties agreement. The HATE CRIMES ORDINANCE does not give the HUMAN RELATIONS COMMSSION that right. I have never given anyone my power of attorney to settle this case. I do not want a settlement. If there is a settlement the HATE CRIMES will never be reported as required by the FEDERAL HATE CRIMES STATISTICS ACT. I have turned down a 5 figure settlement already and refused further mediation. I want this case to go through the appropriate legal body and the CITY OF LOUISVILLE to stop covering up local HATE CRIMES against gays and admit LOUISVILLE has a GAY BASHER PROBLEM. The real problem is not the bashers but the local government officials who are determined to keep this case secret and behind closed doors. If we are not safe it could be your relatives next OR YOU! "LOUISVILLE KENTUCKY HATE CRIME SONG"
IMPORTANT NEWS: COURT ON 9-13-2007, THURSDAY, 10:00 AM COURT ROOM OF JUDGE JUDITH MCDONALD BURKMAN. This is a declaratory hearing in which the Louisville Jefferson County Human Relations Commission is going to court against the HATE CRIME VICTIM and asking the Court to allow the HRC to settle the civil case against the gay basher Steven L. Redmon without the consent of the hate crime victim. Kellie Watson claims in an affidavit to the Court that the case is just too time consuming and expensive and using up too many resources so now she (KELLIE WATSON, executive director of the HUMAN RELATIONS COMMISSION is asking the court to give the HRC permission to settle the civil suit for less than 1% of the damages the HRC stated in a letter to the gay bashers attorney, JEFFREY B. SKORA "the Commission feels will make the Complainant whole" The stated amount that Kellie Watson signed her name to was over $500,000. Now the same Kellie Watson, is telling the court it is just too hard and expensive to keep up the fight for the victim and Kellie Watson further states "I believe that it is in the best interest of the HRC to be abel to resolve this matter in it's descretion" The HRC is abandoning the HATE CRIME victim's interest in favor of it's own interests. This is a violation of the BIAS RELATES CRIMES ORDINANCE. The affidavit is a confession of the motives of KELLIE WATSON, in the best interest of the Commission she now wants to reduce the settlement amount to less than 1% of what she and the commission stated in writing, is needed to make the Complaintant whole. MORE ON THIS SOON. 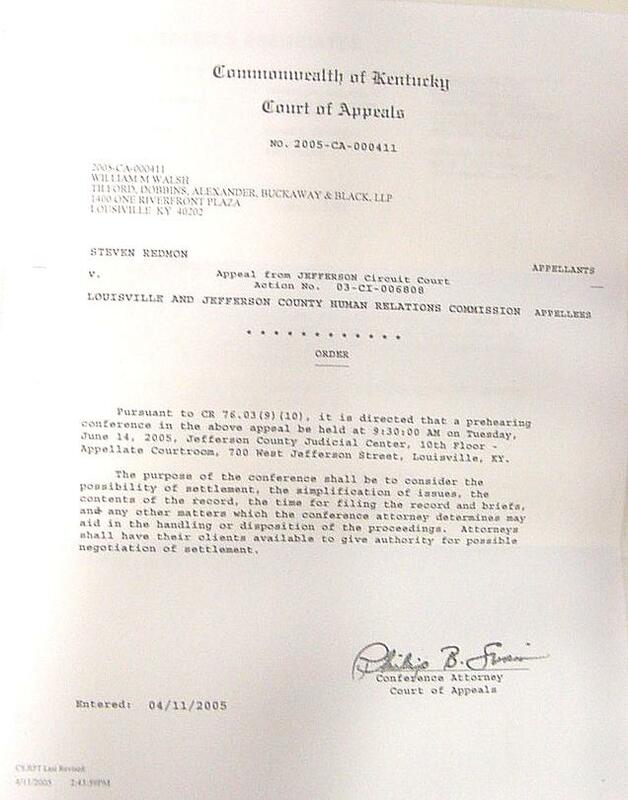 9-14-2007 KENTUCKY COURT OF APPEALS denied our request for a protection order. 9-13-2007 UPDATE: Declaratory hearing with oral arguements was held. No results yet. The Judge in the case has agreed to allow Mark Dobbins one more chance to submit documents. So we just have to wait and see. We are waiting without a protective order. Judge Judith McDonald Burkeman has ruled against us and declared that the Louisville Jefferson County Human Relations Commission can settle our civil claims against the gay basher for less than 1 % of what the very same Commission said, in writing, was necessary to make the victim whole. I am on my way now to pick up a copy of the judgement which I will post to this site. The law firm of Tilford Dobbins Alexander, Buckaway and Black, of Louisville had themselves listed as my attorney at the Court of Appeals and as such they recieved a COURT ORDER of 4/11/2005 which they never told me about, and I never learned of until 9/21/2007. It was too late then as that COURT ORDER was about the June 14, 2005 mediation hearing. I never was told that mediation was COURT ORDERED. That fact was kept hidden from me by TILFORD DOBBINS ALEXANDER BUCKAWAY AND BLACK attorneys William Walsh IV and Mark Dobbins. I was told mediation was up to me. (all of this happened while they were telling me they no longer represented me and were in legal error to have claimed to represent me for the first few years of this case) Why would they tell the Court of Appeals they represented me and tell me they did not? Could it have been so they could hide a COURT ORDER from me? I was not receiving notice because it was going to TILFORD DOBBINS ALEXANDER BUCKAWAY AND BLACK attorneys William Walsh IV and Mark Dobbins. I, and my friends, have survived the gay basher Steven Redmon for years, but we did not survive the HUMAN RELATIONS COMMISSION and WILLIAM WALSH and MARK DOBBINS and other Metro Louisville officials. I am bankrupt and my house has been sold. The gay basher Steven Redmon has said he will get us when this case is over. Well, it looks like it's over. The sad part is we are not alone. This goes on everyday. LOUISVILLE KENTUCKY / METRO LOUISVILLE IS STILL HIDING GAY HATE CRIMES STATISTICS FROM THE FBI AND THAT VIOLATES THE FEDERAL HATES CRIMES STATISTICS ACT. I heard on the news that the Congress is voting on a federal HATE CRIMES bill today. From the damage done by the local HATE CRIME ordinance as interpreted by the Louisville Jefferson County Human Relations Commission / Metro Louisville, I am very much afraid of a federal hate crimes law. and what it may allow some incompetent person to do to a hate crime victim? If you want to know what the law means then do a web search for the Dead Kennedys singing "I fought the Law" The Law destroyed the victims. You have done what the gay basher could not do, you have destroyed us, money wise, and provided much more mental stress, and humiliation than the gay bashers, either directly by your actions, or by your decisions to not act to help us, or perhaps even incompetence of how to proceed. Resignation would be a noble act and appropriate. ONE LAST PLEA: Please don't do this to the next hate crime victim. Saddest part of all is there will be MORE victims. No one has yet told Steven Redmon or his conspirators to stop. 10/4/2007 I just recieved this copy of a COURT ORDER that was kept a secret from me, a named party in the suit, and one of the hate crime victims of Steven Redmon and his conspirators. At the right is the COURT ORDER that WILLIAM WALSH AND MARK DOBBINS OF TILFORD DOBBINS ALEXANDER BUCKAWAY AND BLACK kept hidden from the hate crimes victims. William Walsh was listed at the Court of Appeals as "attorney for Jesse Garon". William Walsh took this COURT ORDER and kept it secret. Mark Dobbins of TILFORD DOBBINS ALEXANDER BUCKAWAY AND BLACK also kept this court ORDER from the hate crime victims. Mark Dobbins was telling the hate crime victim that mediation was at the option of the victims. The victims repeatedly declined. What the victims did not know because of the deception of William Walsh and Mark Dobbins was that a COURT ORDER had been issued for mediation. The ORDER says "Attorneys shall have their clients available to give authority for possible negotiation of settlement." To not inform the victim, a named party in the lawsuit of this ORDER is a deliberate act on the part of the very lawyers claiming to represent the victim. Mark Dobbins, William Walsh, and the METRO LOUISVILLE JEFFERSON COUNTY HUMAN RELATIONS COMMISSION AND KELLIE WATSON kept the location of the mediaton from the victims and then agreed at the secret location to settle the victims $500,000 plus in damages for less than $2,501. The HRC has acted contrary to the hate crimes ordinance and admits in a sworn statement that it was just too time consuming and expensive to continue the lawsuit for the collection of the victims damages. Kellie Watson, the executive director admits in the sworn statement that the victims were never given the location of the mediation and in the best interests o the HRC the HRC should be able to settle the lawsuit, without the consent of the named party/victim, for less than 1% of the damages that Kellie Watson said in letter to the gay bashers lawyer, the Commission feels is necessary to make the complainant whole. When things get too time consuming and expensive the HRC admits they act IN THEIR OWN BEST INTERESTS. That is contrary to the hate crimes ordinance. 05/28/2009 The Louisville Jefferson County, Louisville Metro HUMAN RELATIONS COMMISSION has sued the gay hate crime victim and the HRC is still not reporting the gay hate crimes as required by the FEDERAL HATE CRIMES ACT. This case is now going to the KY SUPREME COURT. 08-18-2009 THE CASE IS CURRENTLY ON APPEAL TO THE KY SUPREME COURT. Just saw a report on TV about a mayor who heard a woman scream and came to her aid. The mayor was harmed but he still came to the aid of the person in trouble. That is a hero. In the decade this case has been going on we have been begging for help from Louisville Metro Mayor Jerry Abramson and the office of the Mayor. Jerry Abramson should be ashamed to admit he has ingnored our pleas and has used the Louisville City Law department to try to silence us. Louisville Metro has a gay hate crimes ordinance. Louisville Metro has a Mayor who is supposed to be in support of the minorities protected by the hate crimes ordinance. The Louisivlle Metro ordinance calls for the city law office to assist the victim in the case, NOT try to silence them, NOT lie to them, NOT hide COURT ORDERS from them. Jerry Abramson you should be ashamed and resign as mayor, NOT run for a higher office. Who will you allow to be hurt next? Who's pleas for help will you ignore if you get in higher office? Mayor Jerry Abramson, Please resign and allow someone who will uphold the Louisville Metro Hate Crimes Ordinance to be enfored. WHY IS MAYOR JERRY ABRAMSON, and the LOUISIVLLE METRO HUMAN RELATIONS COMMISSION not reporting the hate crimes we have experience to the FBI as is required by local ordinance and the FEDERAL HATE CRIMES STATISTICS ACT?